After our rant against Exclusive content it seems one developer was on-top of making things a bit more fair. Borderlands developer Gearbox will be releasing 8 guns for those who pre-order the game, only with a happy co-op ending this time. The exclusive pre-order from Gamestop for Borderlands has two things going for it, one involves co-op while the other is just a bit of hard work. In Borderlands there will be a lot of bartering for things in co-op, and the per-order code for the 8 exclusive guns covers any new character you wish to make. That way, you can make a new character and trade your 8 guns to a friend in co-op (or, 8 friends with different shooting-style preferences) then play with your preferred character who also has all the guns. "According to Gearbox, each new character you create will have these guns, and there's no limit to who you give them to. So, theoretically, you could create a bunch of starter characters and dole out the weapons to friends that didn't pre-order the game." 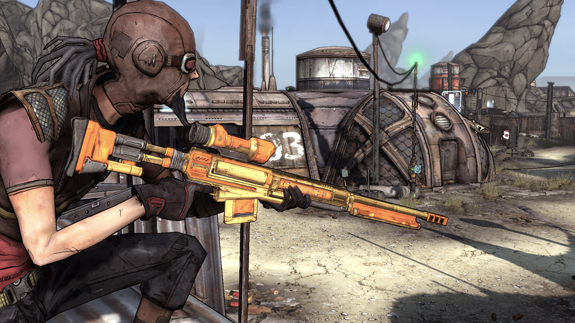 Since Borderlands focus is on guns, thousands of them in fact, you will do a lot of gun-searching while playing. These 8 guns: pistol, shot gun, sniper rifle, rocket launcher, assault rifle, etc will be somewhere in the realm of Borderlands. The downside here is: They may be difficult to find amongst the plethora of other gun options through the game. Both of these options make this exclusive in-game content pack our favorite to date: The incentive to pre-order is there for those that can't live without the 8 special guns, while still giving those of us who can't pre-order because of monetary restrictions or other reasons the option to play with these in-game weapons. Special bonus to Gearbox for encouraging the co-op trading system with this pre-order. What do you think of this type of pre-order exclusive? Better, worse, or no different than things like The Juggernaut Pre-order exclusive?